10% discount for repeat guests and last minute bookings MUST contact owner, as there is no provision to offer such discounts through this website. 2 bedrooms, 2 baths, sleeps 7. Please do not ask us to exceed occupancy limits. We do our best to keep our calendar and rate information current. Please consult these before inquiring. Pine Rock Cabin is a charming knotty pine cabin within walking distance to Bear Mountain Ski Resort (free shuttle to Snow Summit), golf, zoo, and the forest boundary. Just a few minutes drive from the well stocked and beautiful Big Bear Lake, and the popular village shops and restaurants. Recently remodeled and redecorated interior is exceptionally equipped with a 42' flat-screen TV in the family room, plus additional TVs in the game room and bedrooms, DVD/VCR, stereo, 2 fireplaces, wi-fi, games, books, videos, wet bar, electronic dart board, 8' pool table, and full-sized washer/dryer. Kitchen well stocked with micro, coffee pot, toaster, stove/oven, dishwasher, blender, and all the pots, pans and dishes to satisfy your culinary needs. Two extra large bedrooms and bathrooms include king bed in the master and queen bed in the guest room, and laundry facilities. Family room includes a queen sleeper sofa and full sized futon couch. A port-a-crib is available for infants. Exterior boasts spacious wrap around decks with gas BBQ, picnic table. Large triple-sized lot is perfect for families. Plenty of room to build a snow man, sled down the gentle hill, and a swing for the little ones. Because this is our second home, we keep it well maintained. We’ve outfitted it with all of the comforts of home, including blow dryers, games and puzzles, and all the conveniences of our primary home. 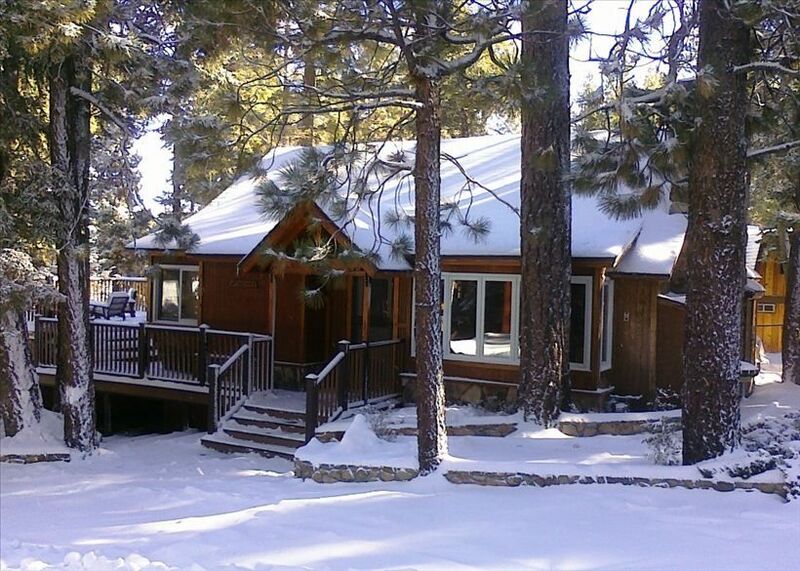 Pine Rock Cabin is a family friendly cabin in a peaceful residential neighborhood. Because we respect and value our neighbors, we will not rent to vacationing students or singles under 25 years of age unless accompanied by a guardian or parent over the age of 25. $300 refundable rental/security deposit. 8% tax applies to rental amount (rates shown below) plus non-optional $100 cleaning/snowplowing fee. Please note that holidays and weekends may not be split to avoid the minimum nights at the listed rate. toilet, shower, Full-body spa spray shower. Large capacity washer and dryer in the Master Bath. Large dining table with 6 seats plus adjacent wet bar with 4 seats. Additional fold-up seats available to add to dining table. Big Bear Lake Golf course across the street. We really enjoyed our stay at Tobi’s cabin during the holidays. The Christmas tree set the perfect atmosphere. The kids enjoyed the fenced back yard - perfect for snow play. The kitchen is well stocked and although the stove could use updating we were able to cook our meals without any issues. Tobi was very responsive and made sure we had everything we needed. We hope to be back soon. Perfect for our family of 4! Close to village, skiing, and snow play right up the street. Thanks Tobi for making our weekend getaway memorable. We all loved the cabin it was very comfy and relaxing also very clean. Two fireplaces, pool table, comfortable beds and gorgeous, quiet property. Would love to come back again! Great for small family that likes pool, darts & games . Close to the slopes in great neighbor hood. We loved this place as soon as we got there. You start looking around and it just kept getting better. Comfort of a cabin with the knotty pine walls and ceiling with a modern twist in the bathrooms. The outside decks are amazing with a picnic table on each deck front and back. Having 2 fireplaces, for each game and living room for each set of family needs is a great function that suited me best. Plenty of games and board games for kids as well. Fully stocked kitchen for what you need to cook, bbq, and bake. The location is prime for the slopes being only 10 minute walk to Bear Mountain, 5 minutes from the zoo and right next to the golf course. You can tell the owners take pride in this place, so please respect it better than your own so we can all enjoy it for years to come. Very nice place. Would have liked to have stayed longer. A couple of minor things that needed attention but, other than that. Those minor things did not keep us from enjoying ourselves. I would definitely go back!! Walking distance to Bear Mountain Ski Resort (free shuttle to Snow Summit), zoo, golf and the forest boundary. Just a few minutes drive from the well stocked and beautiful Big Bear Lake, and the popular village shops and restaurants. Weekends and holidays include a minimum stay and may not be split to avoid the relevant nightly charge.